‘Global warming’, is a grotesque understatement of the speed at which we approach distruction. It suggests we will be 2 or 3 degrees warmer and suffer a few inconvenient storms. The temperature on Venus is 900 degrees because the greenhouse gases insulate her so well that only little of the sun’s heat can escape. We are adding to the greenhouse gases of this planet very rapidly. There comes a ‘tipping-point’ at which the gases trapped in the Earth crust start to bubble out, from which point there is no imaginable return. Life on Earth will be extinguished and we are on our way to Venus. This exhibition sets out to persuade us that Manet was as much influenced by Italian/Venetian art as by Velasquez and it makes a very good job of it. Manet made three journeys to Italy and in all made around 140 free copies from the masters. In this he was diligently following the normal artistic apprenticeship. The English short guide quotes “if art has had a history and continues to have one, it is thanks to the work of artists and also to their inspection of previous works and the way in which they appropriate them.” It does not tell us who said that originally but certainly a wise person. The present taste for novelty at all costs is a serious hiccup in the slow and unsteady evolution of seeing: ours is a period of regression, alas. This exhibition is a timely masterpiece aimed at the re-education of taste. The show has changed my perception of Manet in several ways. First, instead of the father figure of Impressionism as he is usually described, he was a late comer who refused their first invitation to join them. He made few genuinely Impressionist paintings late in life. Above all he was an eclectic who responded intelligently to many influences. He came nearest to Velasquez before he ever visited Spain: with his Olympia. Her slippers and the silks and satins of her boudoir are pure Velasquez and very beautifully painted. Her juxtaposition with Titian’s Venus of Urbino is interesting but only partially persuasive. Had the curators been able to put a late Velasquez princess beside them the story would have been more complete. Nor can I agree with the guide when it suggests “ sensuality is missing in the Olympia”. I believe Manet set out to give us a Parisian, 19th century version of the Titian but seen very much through the eyes of Velasquez. 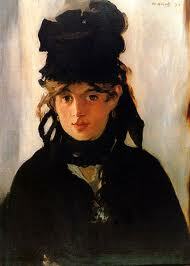 His Spanish trip sees Manet dazzled by sunlight and Goya more than by Velasquez. While his beautiful late portrait of Berthe Morisot seems to owe more to Frans Hals than to Spain. Thus, one of the most original and thoughtful artists of the 19th century was responding to a wide variety of artistic stimuli, last but not least, to Impressionism. A wonderful didactic exhibition – Venice, on till 18th August 2013.